Our weekly spotlight on the best performances on the White Sox farm is back for another season. Each Tuesday, we will take a look at which prospects had the strongest previous week's worth of games, regardless of ranking. Rob Young will reprise his role in writing these normally, but I'm filling in for a couple weeks while Rob is out trekking in some exotic locale. As this is the first week of the season, it's a bit shortened, as we'll only be covering five games' worth of action instead if the usual seven. The Knights haven't had any home cooking yet (their home opener is this Thursday), but they've still had a few hot bats, especially from a pair of offseason acquisitions who each could see time in Chicago this season. Infielder Jose Rondon, who can play all over the infield but has been at shortstop so far in 2018, has posted a .982 OPS to open the year. 3 of his 5 hits have gone for extra bases (two triples and a home run), and he could be the next man up should the Sox need a middle infielder or utility man. Matt Skole apparently took his hot streak from the Cactus League to the International League, as he has thus far posted a .357.471/.429 line after showing well in Spring Training. The big show though, may be on the pitching staff. 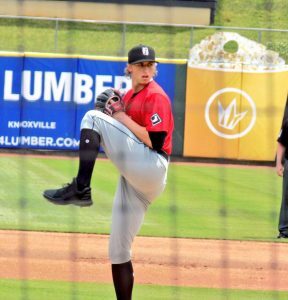 Flame-throwing right-hander Michael Kopech struck out eight batters in four shutout innings during his 2018 debut, allowing a pair each of hits and walks along the way. His 71 pitches in those 4 frames is a little high, but his stuff is clearly getting it done. Dylan Covey as did well in his first start of the season, whiffing six in five frames while allowing a single run and walking none. The two hottest hitters thus far in the Barons lineup are also two players who some thought would be a level lower to open the year. 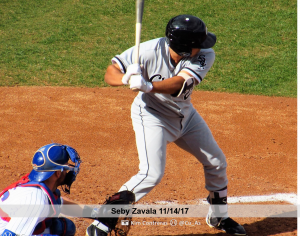 Catcher Seby Zavala is splitting catcher and DH duties with fellow prospect Zack Collins, and apparently the arrangement works just fine for Zavala. In his first four games at AA, he's hit .333 with a home run and a double, and has walked (5) more than he's struck out (4) in four contests. Jameson Fisher was forced to AA despite a middling showing in High-A in the second half of 2018 thanks to the logjam of A-ball outfielders, but he seems to have adjusted well anyway, putting up a .308/.412/.692 slash line. On the pitching side it's somewhat the opposite, as a pair of starters who seemed ticketed for AAA were held back in order to keep some 4-A emergency depth in Charlotte. A;so they have the same first name. Southpaw Jordan Guerrero put up five shutout frames in his first outing of 2018, allowing just a pair of hits and walking no one while striking out two. Jordan Stephens was similarly impressive in six innings of debut work, and while he did allow a run and one walk, he struck out seven and like the other Jordan, allowed just two hits. Offense has been the word for the Dash so far, with a bunch of prospects showing off their hitting chops early. Outfielders Micker Adolfo (.950 OPS) and Blake Rutherford (.921 OPS) have done just fine in a crowd so far, both smacking a pair of doubles. Infielder Mitch Roman, who may be getting more playing time thanks to Jake Burger's absence, has certainly taken advantage of the time hitting .417 with a home run and striking out just twice in 14 PA. Shortstop Yeyson Yrizarri has hit .333 with a home run of his own, plus a stolen base. Many (including myself) thought Dane Dunning would open this season in AA. Apparently he's trying to prove us right, given he cruised through his five inning opening volley, striking out eight and allowing a single run. 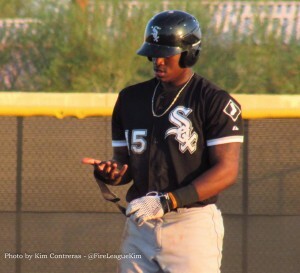 The Intimidators may have opened this year with the fewest big-name prospects among the four full season affiliates, but that doesn't mean they are short on talent, as their strong opening to the season has shown. The offensive MVP on the entire farm thus far has been Kannapolis second baseman Tate Blackman. This 20th round pick from last June has hit .474 with a ridiculous .895 SLG (in just 5 games of course) thanks to two home runs and two doubles. While his draft round last year may not signal high prospect consideration, keep in mind that Blackman was a Top 200 draft prospect out of high school. Michael Hickman has also added some offense, hitting .357/.526/.429, with as many walks as strikeouts (5) thus far. He's played a mix of catcher, first base and DH. Outfielder Tyler Frost is also off to a fast start, hitting .385 with a pair of doubles and a pair of stolen bases in his four games. John Parke opened his 2018 campaign with a strong start, allowing just one run on three hits through seven efficient innings, whiffing six and not walking anyone. Fellow lefty Parker Rigler looked good in his full season debut as well, throwing five innings of one-run ball, striking out four against a single walk. Kade McClure (6 IP, 3 ER, 2 BB, 7 K) and Lincoln Henzman (5.2 IP, 2 ER, 1 BB, 4 K) also got it done in their first starts of the year.